The CD49b antigen is a transmembrane glycoprotein of 150 kDa also known as the α-2 integrin and as platelet GPIa. CD49b non-covalently pairs with the β-1 integrin (CD29, GPIIa) to form the VLA-2 (very late activation antigen) complex. CD49b complexed to CD29 is involved in cell adhesion to collagen. It is expressed by platelets, activated T lymphocytes and thymocytes. Clone Description The Gi9 antibody reacts with the molecule carrying the Br(a) as well as the Br(b) alloantigen. This antibody inhibits the adhesion of platelets to collagen. It detects human alloantibodies (anti-Br a,b) against VLA-2 by MAIPA assay. 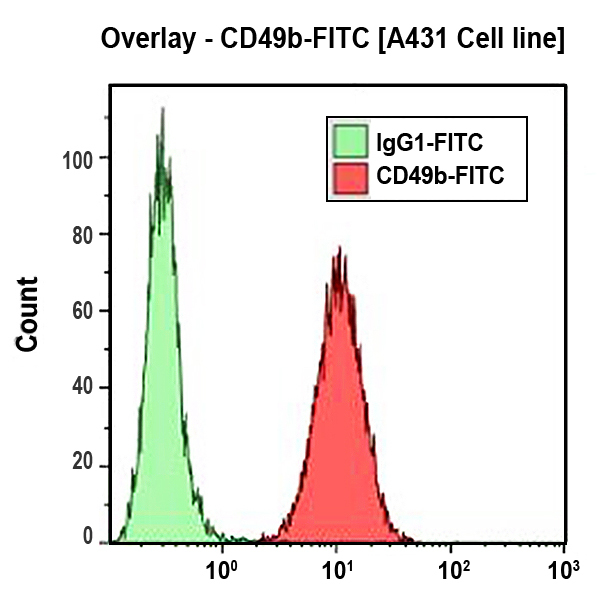 Gi9 was used as a CD49b reference monoclonal antibody during the HLDA 6. Gi9 reacts with platelets and weakly with monocytes. It also stains most adherent cell lines and T lymphocytes in culture.